TODAY: (Updated 2:16 p.m.) In separate interviews with the Quad-City Times today, Democratic presidential hopefuls Hillary Clinton and Barack Obama tangled over Obama’s statement at the YouTube debate Monday that he would be willing to meet in the first year of his presidency with the leaders of countries antagonistic to the United States. Obama countered by accusing the Clinton campaign of hatching a “fabricated controversy” and suggested that her position put her on the same track as the Bush administration. 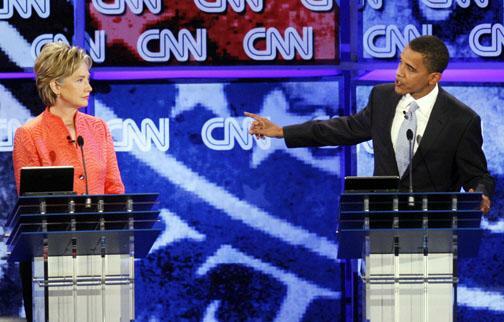 Barack Obama rebuts Hillary Clinton’s statements about his stance on meeting with world leaders. The controversy springs from a question at the YouTube debate asking whether Obama would be willing to meet, without precondition, with the leaders of Iran, Syria, Venezuela, Cuba and North Korea. Obama, an Illinois senator, said he would and called it a break with the Bush administration's diplomatic policies. Clinton, in the debate, said she would pursue vigorous diplomacy but she wouldn’t make such a promise without knowing the other countries’ intent. “I don’t want to be used for propaganda purposes,” she said. Her campaign later circulated a memo to reporters saying it was a “mistake” to commit to presidential-level meetings without precondition "with some of the world's worst dictators" and portrayed her remarks as showing her depth of experience. Obama, in a separate interview with the Times, vigorously defended his comments. “What she’s somehow maintaining is my statement could be construed as not having asked what the meeting was about. I didn’t say these guys were going to come over for a cup of coffee some afternoon,” he said. He added Clinton is making a larger point. He likened the position to a continuation of the Bush administration diplomatic policies. And he said what was “irresponsible and naive” was voting to authorize the Iraq War. Clinton voted in 2002 for the authorization measure but has said since that, in hindsight, she wouldn’t have done so again. In the interview with the Times today, Clinton rejected the idea she reversed herself and added she wouldn’t foreclose talks with those leaders. But she wouldn’t promise it within a certain time frame, either, and she added that Obama is regretting his answer today. Some media commentaries Tuesday said Clinton got the best of the exchange. Obama’s campaign said focus groups favored him. Clinton spoke to the Times to push for a proposal that she and Sen. John Kerry, D-Mass., are offering to require the Pentagon to give a report to Congress about contingency planning to redeploy troops from Iraq. Obama later spoke with the newspaper to respond to Clinton’s remarks, which were posted at qctimes.com. Ed Tibbetts can be contacted at (563) 383-2327 or etibbetts@qctimes.com. Comment on this article at qctimes.com. Clinton, in an interview with the Quad-City Times, said it’s wrong for a president to refuse to meet with other world leaders. But she distinguished her approach from Obama’s. Obama, in response to a question at the YouTube debate Monday, said he would be willing to meet in the first year of his administration, without precondition, with the leaders of Iran, Syria, Venezuela, Cuba and North Korea. He called it a break with the Bush administration’s approach. Clinton said she wouldn’t make such a promise and would want to know the other countries’ intent. Today, the campaigns quarreled over the exchange. Clinton’s campaign had former Secretary of State Madeleine Albright on a conference call with reporters, while Obama’s campaign circulated a memo claiming Clinton’s position was a reversal from a statement that she made in April. Then, the memo said, she called it a “terrible mistake" for the president to say he wouldn't talk with "bad people." In the interview, Clinton rejected the idea she reversed herself and added she wouldn’t foreclose talks with those leaders. But she wouldn’t promise it, either, and she added that Obama is regretting his answer today. “I thought that was irresponsible and frankly naive,” the New York senator said. Some media commentaries Tuesday have said that Clinton got the best of the exchange. Obama’s campaign said focus groups favored him. Clinton spoke to the Times to push for a proposal that she and Sen. John Kerry, D-Mass., are offering to require the Pentagon to give a report to Congress about contingency planning to redeploy troops from Iraq. Clinton said today that she has “reason to believe” planning is being blocked for political purposes. She said she’s received reports from people inside and outside the Pentagon that planning is not being done. “I have been told they are under tremendous pressure” not to plan or admit any planning, Clinton said. “It is regrettable that we have to introduce legislation to force the president to prepare a report to Congress on contingency planning,” she said. Ed Tibbetts can be contacted at (563) 383-2327 or etibbetts@qctimes.com.